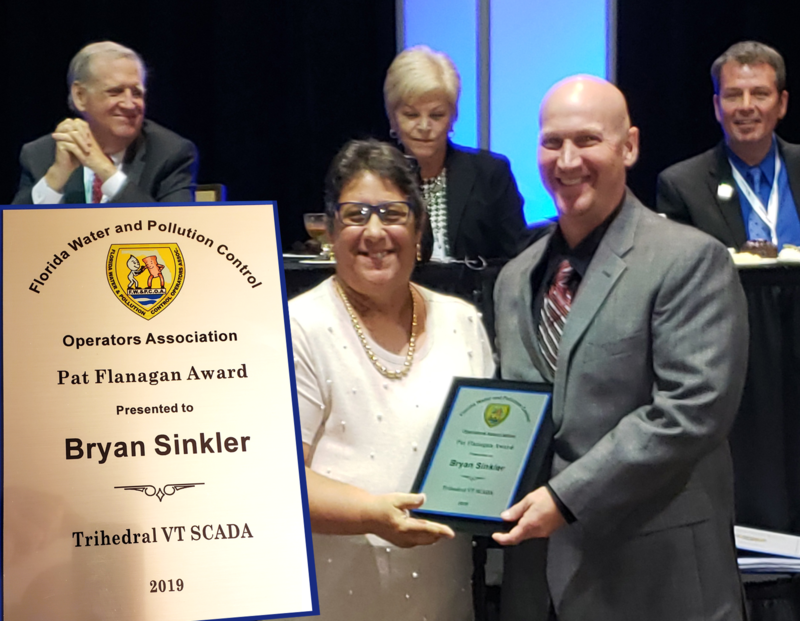 Trihedral is proud to announce that the Florida Water and Pollution Control Operators Association (FW&PCOA) awarded our very own Bryan Sinkler the 2019 Pat Flanagan Award for his contributions to the Florida water and wastewater operator community. He received his plaque at the Florida Water Resource Conference luncheon on April 15th at the Tampa Convention Center. Assistance of operators in training, maintenance and/or repairs of water or wastewater facilities. Assisting in regional or annual meetings or short schools. Providing technical information and service to operators. Based in the VTScada office in Orlando, Florida, Bryan has been serving VTScada software customers across the southeast United States for over a decade. In addition to helping build a thriving VTScada community in that area, he is an active member in several local water/wastewater associations. The award was established in 1964 and in honor of the late Associate Member’s assistance to operators and his contribution to the Operators Association.